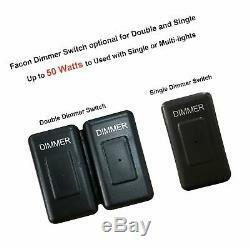 Facon 12Volt DC Touch Dimmer Switch Use with LED lights, Incandescent and Halogen Bulbs for RV, Camper, Marine, and Strip Lights. We are a company focus on providing various kinds of products for recreational vehicle / caravans / mobile home industry and home builder market since early 2006. We have our own manufacturing facility produce LED lightings , residential lightings and RV tank heater pads The "Facon" brand LED lightings have been highly adopted by the North America RV industry and Mobile Home market. 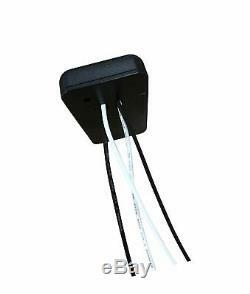 Facon brand Touch Dimmer Switch Works only for 12 Volts Power Supply. Comment Use with LED Lights, Incandescent and Halogen bulbs Optional Single and Double Switch 5Inch LED RV Panel Light with Switch and Indicator Light 4.5Inch LED RV Puck Light Full Aluminum Recessed Mount Down Light New Large Oval LED Pancake Light with On&Off; Switch 4.5Inch LED Surface Mount Light with Lens Touch On&Off; Switch Little Star Oval Pancake Light with On&Off; Switch LED Double Dome Ceiling Light Single Touch Dimmer Switch This is a 12 volts touch dimmer switch. Dimension(inch): 2.6'' x 1.6'' x 0.6'' Finish: Black Comment Use with LED Lights, Incandescent and Halogen bulbs Up to 60 Watts to Used with Single or Multi-lights Touch - On/Off Hold - Dim/ Bright At the circle of center of about 3 / 8 round circle area, is the better touching area. 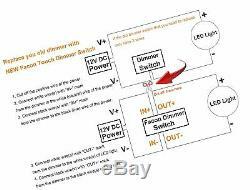 Read more Double Touch Dimmer Switch This is a 12 volts touch dimmer switch. Dimension(inch): 3.2'' x 2.6'' x 0.6'' Finish: Black Comment Use with LED Lights, Incandescent and Halogen bulbs Up to 120 Watts to Used with Single or Multi-lights Touch - On/Off Hold - Dim/ Bright At the circle of center of about 3 / 8 round circle area, is the better touching area. 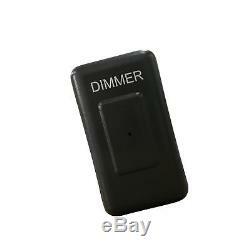 Read more ELECTRICAL CONNECTIONS First connect the dimmer to 12 volts power supply 1. Connect white wire(s) with IN- mark from the dimmer to the white (neutral) wire of the supply circuit. Connect black wire(s) with IN+ mark from the dimmer to the black (live) wire of the supply circuit. Then connect the dimmer to your lights 1. Connect white wire(s) with OUT- mark from the dimmer to the white wire(s) of LED lamps. Connect black wire(s) with OUT+ mark from the dimmer to the black wire(s) of LED lamps. Open the cover from the dimmer switch 1. You can see there is a small hole at both side of the dimmer switch. 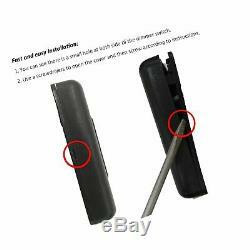 Use a screwdrivers to open the cover and then screw according to instructions. When the dimmer is connected, the indicator light begins to work, and will be at OFF status B. For turning off, do it again C. To Dimming after turning on, keep the finger on touch pad, dim the brightness from low to high Or vice versa, and after reaches the highest or lowest brightness, it will start dim again To turning off after dimming, leave the finger from touch pad for more than 1 second and touch again D.
At the OFF status, keep the finger on touch pad, the lights will be dimming from low to high E. The dimmer has a memory function When the light turns on, the brightness will be at the status of the last time when it was turns off Read more How to replace a old dimmer with 2 wires only Normally, a dimmer switch have 4 wires: 2 wires connect to power and 2 wires connect to lights. But some dimmer switch only have 2 wires, because the positive wire from the power and the lights was connected together. 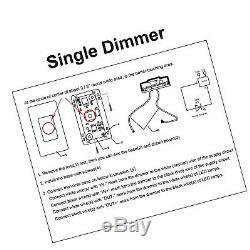 Please refer to this wiring instructions, if your old dimmer comes with 2 wires only. If your RV only have 1 wire, and it is positive wire. 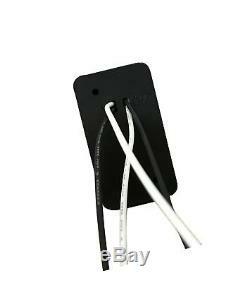 Please connect the white wirenegative(-) wire to the metal frame on your RV / Camper / Trailer. By entering your model number. Optional Single and Double Touch Dimmer Switch. Full range of brightness control: Hold - Dim to Bright. Compatible to Use with LED Lights, Incandescent and Halogen bulbs. Rate up to 60 Watts to Use with Single or Multi-lights. CETL Certification provide more safety. Read the wiring instructions carefully before installation. Item Weight: 1.12 ounces. Package Dimensions: 5.5 x 5.2 x 1.4 inches. Date First Available: May 16, 2017. The item "Facon 12Volt DC Touch Dimmer Switch Use with LED lights, In. FREE 2 Day Ship" is in sale since Thursday, January 10, 2019. This item is in the category "Home & Garden\Lamps, Lighting & Ceiling Fans\Lighting Parts & Accessories". The seller is "homeitemstore" and is located in Minneapolis, Minnesota. This item can be shipped to United States.